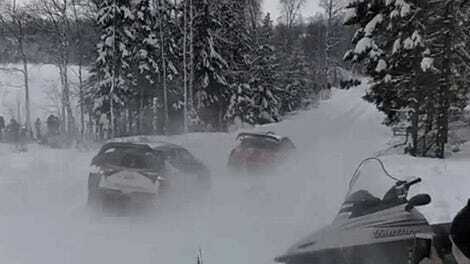 Rally Sweden was a winter wonderland this year, but not for the drivers who went first. The first cars on a snowy stage inevitably act as snowplows for everyone behind them—and those later competitors then go faster on the clearer roads. One driver at Sweden had enough, so he arrived late to one stage, breaking the rules on purpose to avoid going first. Snowy conditions on Day 1 of the rally. The World Rally Championship sends the championship leaders first on the first day to make it harder for their fastest drivers, as that’s usually the dustiest, snowiest, rockiest and/or all-around hardest to drive starting position. To switch it up for the second and third days of a three-day rally, they reverse the standings of the current rally to send the slowest cars of the weekend out first instead. There’s only been one rally so far—Rallye Monte-Carlo—and it was won by five-time WRC champion Sébastien Ogier. As such, Ogier’s Fiesta was on snowplow duty for nearly the entire rally. Worse yet, the national and historic series ran the stage roads before the WRC cars, and they use narrower tires than the WRC cars, Motorsport.com notes. Narrow tires on those rear-wheel-drive rally cars cut grooves in the ice that made the early runs of each stage even harder than usual to navigate. Because Ogier couldn’t find any speed through the snow after starting first Friday, he also started near the front on Saturday. He went into the last day with only one point—a miserable result near the bottom of the main WRC standings. So, Ogier’s M-Sport team found a clever workaround: intentionally arriving late and getting penalties. Looking at a gnarly fourth-place start for Sunday’s power stage—which awards extra points—Ogier intentionally showed up late to let more of the other cars plow the stage for a change. 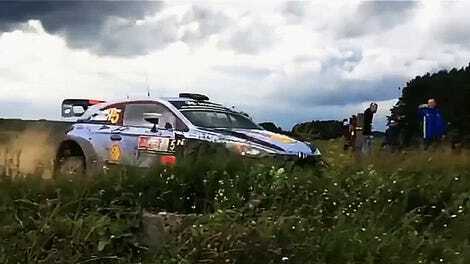 Consequently, Ogier went second fastest on the power stage and got four power stage points. We knew that this event would be difficult, especially if there was fresh snow on Friday, but we faced a bigger disadvantage than I think any of us had expected. With nothing to lose we had to try and salvage something so the team made the decision to delay Sébastien’s start for the final stage – giving him an equal chance of securing some points. Ogier dropped to eleventh place overall after getting handed a four-minute, 10-second penalty for the shenanigans he pulled to start later in the power stage, meaning that he wouldn’t get that one extra championship point. So, M-Sport had their other driver Elfyn Evans show up late for the final control zone on purpose to cede tenth to Ogier—something Ogier described as a “team strategy” to the WRC. While it’s a little early in the season to be prioritizing one teammate over another, Ogier has won the WRC past five years in a row. If anyone can pull off six championships in a row, it’s probably him. Man, I can’t even be that mad at this. Intentionally getting penalties to move Ogier ahead in Sweden is clever as hell, and probably the next weird racing loophole the WRC might want to patch. 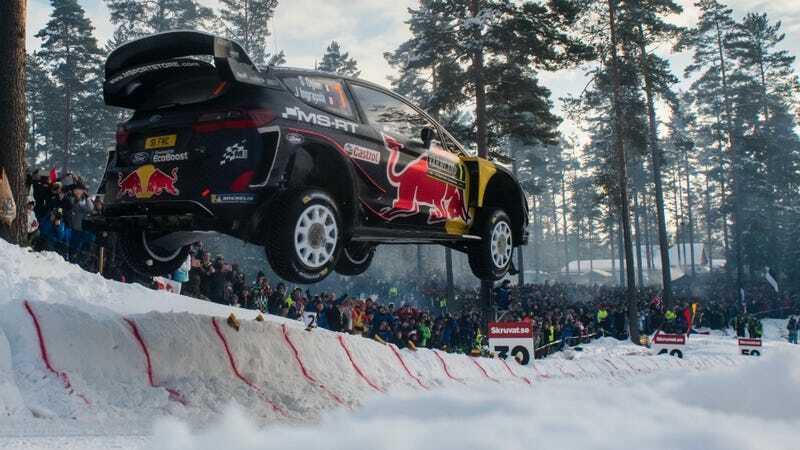 Hyundai driver Thierry Neuville ultimately won Rally Sweden overall.